Summer in the UK means unpredictable weather, major sporting events and, of course, the obligatory BBQ or two. And what party is complete without the ultimate luxury – a hot tub! Why not combine all of these elements and throw one big summer hot tub party? Our hot tub party ideas and tips are guaranteed to entertain your guests are entertained, well-fed and fully satisfied after experiencing a party to remember. Throwing a hot tub party is a surefire way to entice guests and keep them entertained for hours. Make sure it’s clean and in tip top condition for when your guests arrive, and make your hot tub themed party even better with the addition of show-stopping accessories like our spa butler and even novelty rubber ducks. If it’s set to be a scorcher, you’ll need a hot tub umbrella to shade guests as they relax and soak. It’s also worth having spare towels on hand for anyone that’s forgotten to bring their own. With the World Cup and Wimbledon dominating the summer season, what better theme than a sporty soirée. With nearly 71% of the UK’s adults planning on watching the World Cup this summer, a World Cup party will allow football fans to watch the games, while those less keen can use it as an excuse to get merry! The same goes for Wimbledon. A BBQ is the classic garden party solution, as it is a simple way to combine cooking and being the hostess with the mostest. If you’ve gone for a World Cup party theme, serve up British burgers and pies. If you’ve gone for a Wimbledon theme, a picnic-style menu would suit better, such as finger sandwiches followed by strawberries and cream. Ultimately, we suggest choosing food that is the least hassle for you as a host, and will enable you to mingle with guests whilst supplying them with treats. When it comes to drinks, prepare themed-cocktails that can also be made in bulk. Jugs of Pimms, frozen margaritas or ice cold beer will go down a treat! Keep them cool even on the warmest of days with the help of our spa bar cooler. An important part of any party is the entertainment. Garden games such as garden Jenga, swing ball sets or even board games are a great way to entertain, while table tennis and football are the obvious choices for sports-themed soireés. 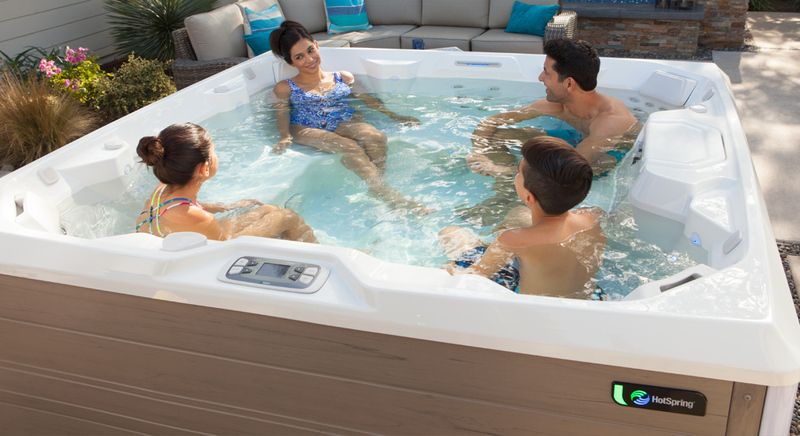 Of course, your hot tub will provide endless entertainment too, and you could even set up a wireless TV so that guests can watch sports matches from the comfort of your spa. Create a playlist on your music library and add all your favourite songs to it. If you are having a themed party, have some fun picking music that ties into your theme, such as famous theme tunes to sports shows, jazz music or latin pop. If you have the time, why not ask guests to send you a selection of their favourite music that you can add to your party playlist before the big day. A good sound system is a must for any party, and our wireless audio system will ensure your playlist is enjoyed by guests in and out of the hot tub. Decorations should be chosen according to your theme, though bunting and flags are a great and simple way to jazz up your garden without taking up too much space. Tablecloths and napkins are another good way to add personality to your party. If you plan on staying outdoors past sunset, it’s important to think about how you’re going to light up your garden in the dark. Invest in solar powered lights or fairy lights for that dimly-lit. atmospheric feel. For the ultimate finishing touch for your hot tub party, we offer some amazing lighting options for some of our hot tub models, providing state of the art LED lighting for your guests to enjoy when the sun goes down. You’re ready to throw the ultimate summer hot tub party! 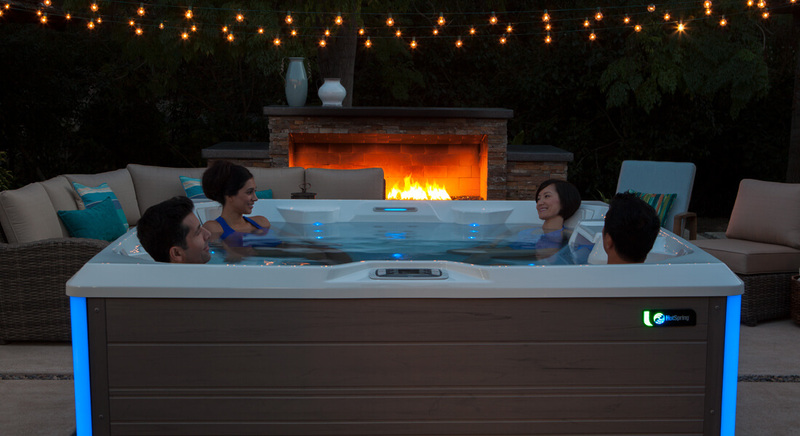 With so many hot tub party ideas to choose between, from different themes and decorations to food and entertainment, there’s no time like the present to get planning! Whether you’re raring to host a wild World Cup party, a quintessential Wimbledon do or a no-excuses-needed BBQ, a hot tub and some fun accessories will ensure your garden party is the talking point of the town. If you don’t already have one and you’re looking for a spa that can be used to entertain guests, choose one that will fit plenty of people. At HotSpring World we have hot tubs that seat up to seven people. Browse online or visit one of our showrooms today!